Most parents are wondering what to do when their child is having a tantrum, or what to do when they are hitting. But a lot of parenting challenges can be resolved when everyone is calm. Sometimes we don’t take advantage of this time because we might forget. But even more often, we don’t want to “rock the boat” when things are good. We don’t want to lose the good part by bringing up the bad part. There are a lot of things you can do when things are calm to help the times that aren’t calm. The best strategy for calming down is to take a deep breath. It works for kids, it works for adults. Young children love imagery so you can say, “Smell the flowers. Blow out the candle.” You may not think that you have to practice, but when everyone is in the heat of the moment, breathing deeper is a lot harder than you’d think. If you are eating dinner together, you can start the meal with two deep breaths. That helps your daily practice, as well as setting the stage for a nice meal. Another strategy for calming down is taking space. You can talk to your kids about taking space and how it helps calm you down and then actually act it out. Pretend that you are upset and then go into your room. Come out a minute later much calmer and talk about how taking space helped. There are many great anger and tantrum books out there that you can read with your children, but the best book that you can use to help your child is one that you wrote about your situation. Does your child always get upset about their little brother? Write a book about it with real pictures! Does your child throw things all the time? Write a book about it! Then you can discuss the book and the behavior with your child when everyone is calm. This one is so important. Don’t wait until the behavior happens to make a plan. Make a plan in the morning or evening when everyone is calm. Start by mentioning the unwanted behavior. “Do you remember what a tough time we had going to bed last night? You were fussing about not getting enough water (stories/hugs/potty trips/etc). Let’s make a plan so that it doesn’t happen again tonight.” Then after you mention the problem, you can start coming up with ideas on how to do things differently this time. Also come up with a plan if things don’t go well again. Make this part of your daily routine. Whenever you see someone helping out, mention it. “I’m taking care of you guys by making breakfast. You are taking good care of your kitty by being gentle. Papa takes good care of us by working so hard. Thank you for taking good care of your toys. Your hug just made me feel so good- you take good care of me.” Being part of a family means taking care of each other and it is good to point out each time it happens. My favorite quote is “The way we talk to our children becomes their inner voice“. So if a child hears that they are “crazy monsters”, then they will become a crazy monster. If a child hears that they are a “good helper” then they become a good helper. The best way to deal with conflicts present and future is to eat a meal together without devices. Eating a family dinner is one of the best things you can do to help your child’s behavior. It is the perfect time to bring up situations in a non-threatening way and you can find solutions to help solve future problems. A tired kid is a cranky kid. Compare your child’s sleep with how much sleep they should be getting. 10) Have a tickle fest! Have fun together as a family. Kids are a riot. Enjoy them as much as you can and you will release a lot of stress and find yourself enjoying each other a lot more! Enter your email address here to be updated with new parenting ideas and inspirations. I will send you my Top Three Tips that you can start using tonight! How Important is a Consistent Bedtime? Parenting is no longer intuitive. 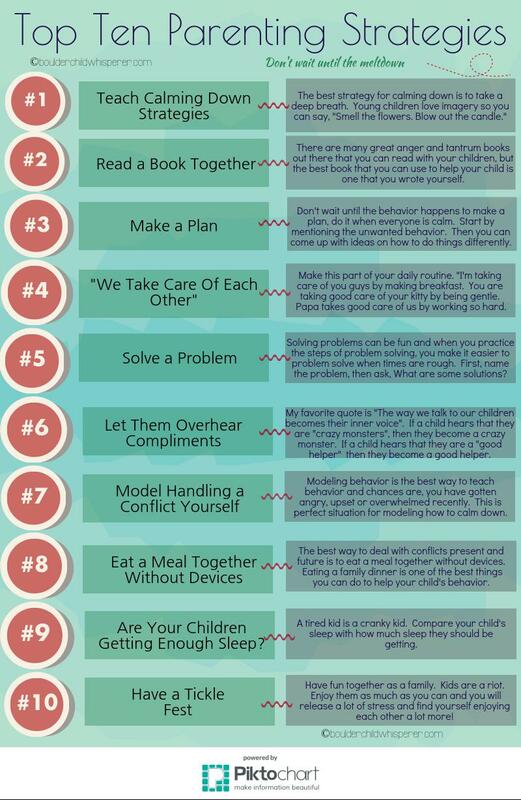 Want more balanced and mindful parenting tips? Subscribe today and get my Top Three Tips that you can use tonight for FREE!